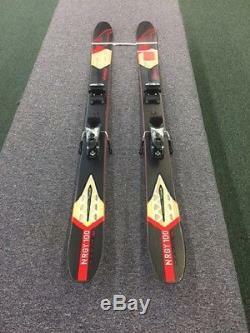 BRAND NEW, NEVER SKIED NORDICA NRGY 100 WITH MARKER FREE TEN BINDINGS, MOUNTED TO A BOOT MONDO SIZE 27.5..... 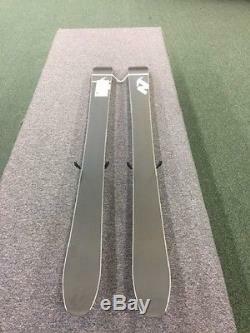 THESE SKIS AND BINDINGS ARE BRAND NEW NEVER BEEN USED. THEY HAVE BEEN PROFESSIONALLY MOUNTED BY OUR CERTIFIED TECHNICIANS. THE BINDINGS HAVE BEEN TESTED AND PASSED 100%. WE DO A SERIES OF OFF SITE SALES AND THESE WERE LEFT OVERS THAT DID NOT SALE. THE SKIS AND BINDINGS STILL COME WITH 1 YEAR FACTORY WARRANTIES. WE CAN FULLY RE-ADJUST or REMOUNT (if needed) TO YOUR BOOT SIZE AND WAX THE BASES AT NO CHARGE. NOTE: THERE MAY BE A SMUDGE HERE OR THERE ON THE TOP SHEET. THIS COMES FROM LOADING AND UNLOADING THE SKIS FROM OUR TRUCKS/TRAILERS. BUT NOTHING THAT IS MORE THEN COSMETIC. These skis are fat, but that's not a bad thing. The Nordica NRGy 100 Skis can cut through crud and bumps with their All Mountain camRock, but they also can have you carving at high speeds with ease. You'll be sitting on i-Core technology, but you'll barely realize it because it is so incredibly lightweight. I-Core is laminated wood mixed with titanal that together form a punch of pop and snap in all conditions and terrain. Versatility is the name of the game and the NRGy 100s will get you all that and more. 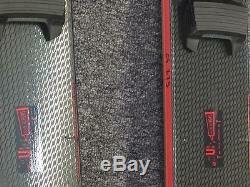 These are factory blem skis that may have slight cosmetic damage. All Mountain camRock technology pulls the traditional contact point of the tip back about 25% creating slight tip rocker to aid the camber under foot. The result - increased flotation, velocity and maneuverability in soft snow as well as significantly increased easy of turn initiation in any condition. A new modern shape with a little relief on either side that makes the ski super playful and easy to steer in soft snow. Tapered tail with a little rocker to make the skis really maneuverable off piste yet strong and powerful on hard pack. Full woodcore with Torsion Bridge technology has allowed Nordica to build the next generation of All Mountain skis. By removing specifically engineered geometric shapes from a full sheet of Titanal, the Torsion Bridge provides NRGy skis with the performance of metal without the extra weight and sluggishness that typically comes with a traditionally constructed metal ski. This results in a revolutionary construction that is extremely lightweight yet torsionally strong and confidence-inspiring in all conditions and terrain. BINDINGS-Marker Free Ten Ski Binding. Marker designed the Free Ten with intermediate-level, terrain-park, and all-mountain skiers in mind. A 3-10 DIN range allows intermediate skiers to charge hard in the park and is versatile enough to grow with you as you progress to an advanced level. The Free Ten's AFD Gliding Plate anti-friction device allows for a safe and precise release that is unhindered by dirt, snow, and ice buildup. Marker's Compact Heel piece is lightweight while maintaining exacting release properties for your safety and peace of mind. Marker gave this binding its Triple Pivot Light Toe, which features a horizontally oriented spring and compact design to maximize power and cut down on annoying weight. Ski the whole mountain with this well-rounded binding. 3-10 DIN range is ideal for progressing skiers. Compact 2 heel saves weight and is low-profile. Gliding AFD plate provides a smooth and safe feel. 4- ALL ITEMS ARE BRAND NEW NEVER BEEN USED, UNLESS OTHERWISE STATED IN AD DESCRIPTION. 5- ALL NEW ITEMS COME WITH MANUFACTUERS WARRENTIES, UNLESS OTHERWISE STATED IN AD DISCRIPTION. 6- ALL ITEMS ARE NON-RETURNABLE. IT IS BUYERS RESPONSIBILITY FOR SELECTION / SIZE / COLOR/MODEL. All items are guaranteed authentic and 1st quality unless otherwise stated. Also know that some items will have slightly different cosmetic differences, example some goggle straps will be slightly different, and some snowboard bases will have same design, but may have a different color pattern than shown. The item "NEW NORDICA NRGY 1OO WITH BINDINGS SKIS 169CM with MARKER FREE TEN-mounted" is in sale since Wednesday, February 22, 2017. This item is in the category "Sporting Goods\Winter Sports\Downhill Skiing\Skis". 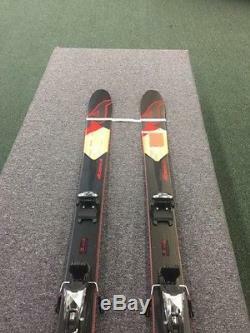 The seller is "skiandboardrs" and is located in CITY,IDAHO. This item can be shipped to United States.